Medical doctor Christian Jensen, 58, runs a medical practice in a small town in Denmark. This autumn he left his day job for a month to help migrants in distress in the Mediterranean Sea. 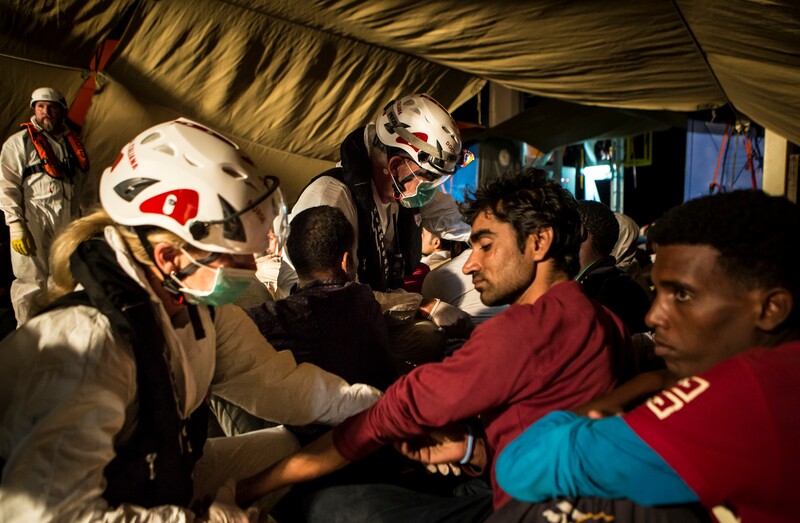 Christian worked as a doctor on board the rescue ship The Responder — a partnership between the Red Cross Red Crescent and Migrant Offshore Aid Station (MOAS) to save the lives of people in search of refuge and safety trying to reach Europe. I’m woken by my walkie-talkie alerting me that two boats have been spotted on the radar. I’m up and ready within two minutes. It’s pitch black at sea but our searchlights have spotted a small wooden boat with 25 people on board. One of the Responder’s satellite vessels sets towards the boat to help the migrants who thankfully are all wearing life jackets. The rescuers instruct them to be calm during the evacuation so the boat doesn’t capsize. The physical condition of the passengers is okay, but they are cold and afraid. 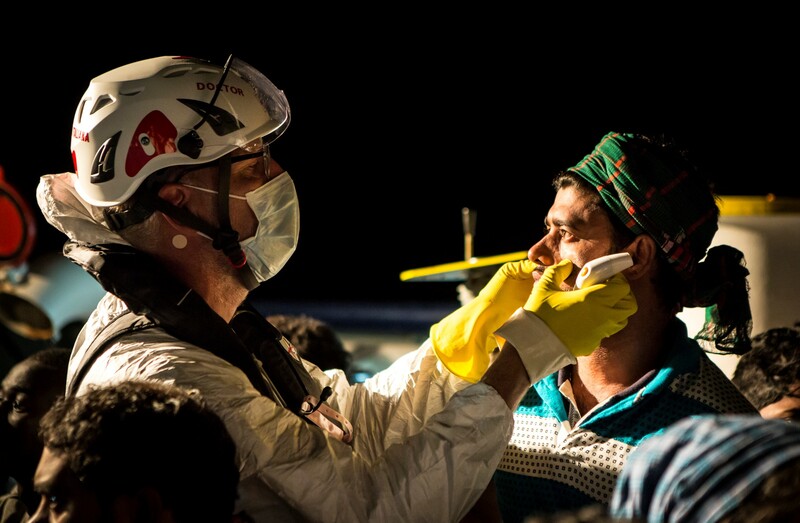 I closely observe their overall condition as they come on board to make sure no emergency medical cases are among them. When everyone is safely on board the ship, we examine them for any health issues. 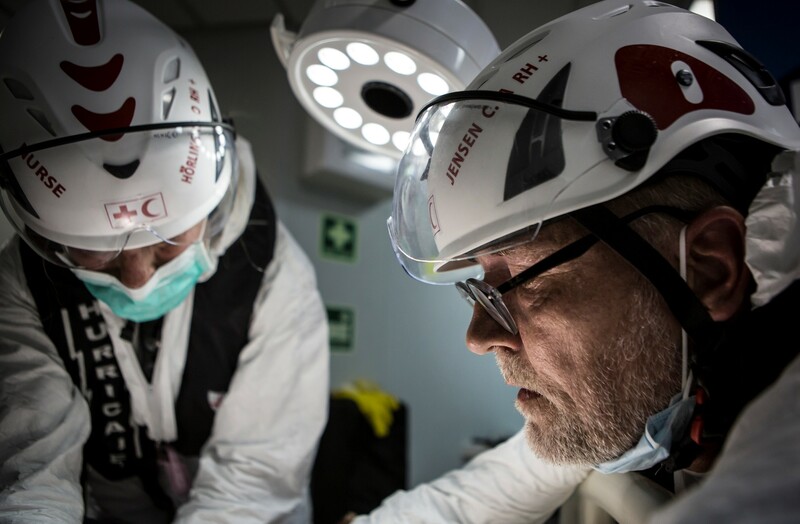 The rescue ship is more of a floating ambulance than a hospital and it’s not possible for us to treat them as thoroughly as we would at a Danish medical facility. Our job is to stabilize their health situation and keep them dry, warm, and hydrated until they get to shore in Italy. Luckily, most of this boat’s passengers are doing well despite having been on the move for several months or years. Many of them have written their names and contact information on the back of their life jackets so that their loved ones can be informed if they drowned. A 28-year-old man has been separated from his fiancée in the commotion when boarding the boat on a beach in Libya. He doesn’t know what has happened to her and is obviously very distressed. Another boat has been spotted. Once again it is a wooden boat with about 25 people on board. This group seems more traumatised by the journey. Some of them break down in tears as they board the Responder. 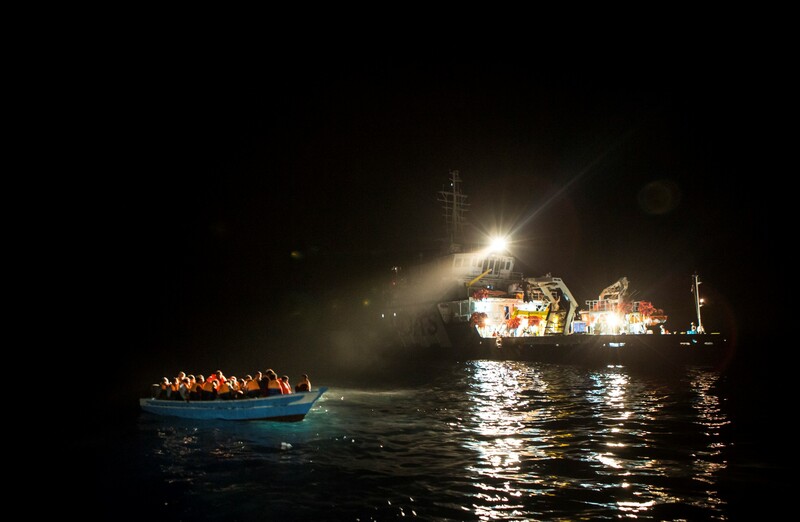 A 14-metre-long rubber dinghy has been spotted. It’s filled to the brim with 170 people — among them several pregnant women. 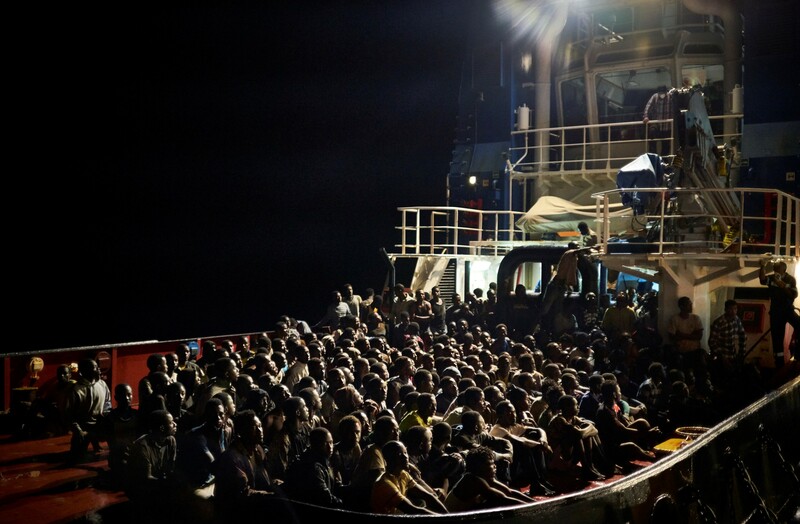 Responders deck slowly fills with people whose last months have been hellish. Both men and women talk about the slave-like conditions they faced in Libya and many show me wounds and bruises from beatings. A man tells me that he lacked 1,000 Euros for the boat ticket, which led to him being locked in a house for three months. He was forced to do chores and was often beaten with wooden sticks. The women prefer not to go into details about what has happened to them, but it’s not difficult to imagine what they may have been through. When all the exhausted passengers have been examined, most of them fall asleep on the deck. It might be the first sleep they’ve had without the risk of being assaulted for months. I’m alerted to a woman who has stepped on something sharp in the rubber dinghy and has a deep wound on the sole of her foot requiring stitches. I have a needle and thread, but not all of the proper instruments I would usually use back home. I have to stitch her foot while the ship rocks from side to side in the rough weather. 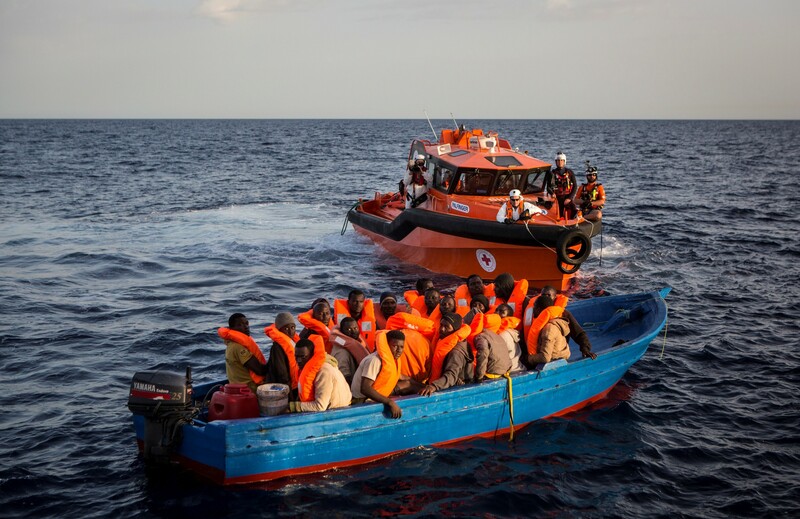 A British military ship has also had to rescued 49 people from the sea and we are asked to transport them to Sicily alongside our other passengers. One-by-one they board our ship. Miraculously, the fiancée of the man we rescued in the morning is among the passengers and they are happily reunited against all odds. See the full story of the couple’s reunion here. Many hours later, we are asked to take on yet another group of people who have been rescued by a tugboat. It’s totally dark when our ship and the tugboat — each 50 meters long — meet at the sea, side by side. It’s a risky transfer, but our captain does it with the precision of a moon landing. The deck of the Responder is now completely filled with people. 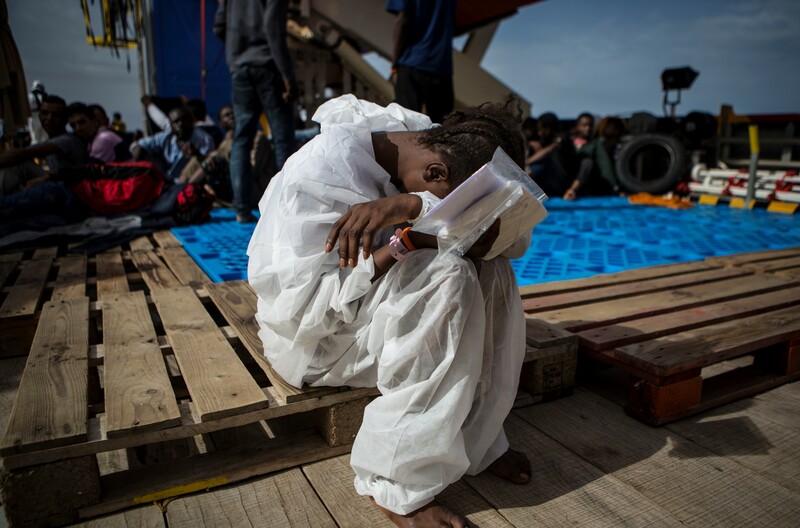 Our latest transfers are not doing well and tell us that they had been at sea for more than two days in miserable conditions. Many have been forced to drink salt water as they had only been allowed to have a liter of water with them for the whole journey. We give everyone water, biscuits and a warm blanket. I spend the next few hours treating the patients identified during the health examinations. Some of them suffer from breathing and chest problems after inhaling petrol fumes on board the old boats. There are also cases of malaria, infected wounds and injuries consistent with a beating. I treat them as well as I can, given the limited capacities we are able to have on board. We also provide emotional first aid to those who are ready to tell us about the hardship and trauma that they have faced. I fall asleep immediately when I finally go to bed at midnight. As the only doctor on board, I’m on call 24/7 so I sleep with a walkie-talkie next to my pillow. My next watch starts at 8 am. I’m part of an international group of Red Cross Red Crescent doctors and nurses who can be deployed to disasters and other situations across the world at short notice. Although the work is far from glamorous, it is rewarding to help those in need and being a part of giving them back some dignity. Both as a doctor and as a human being. It puts my daily, more predictable work in Denmark into perspective. This work is what humanity is all about.